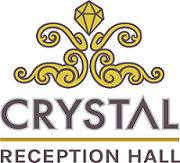 Thank you for considering Crystal Reception Hall for your special event. Our rates begin at $1,600, based on the date and services you need. Our packages can be all inclusive, but also flexible to allow you to bring your own vendors. To give you an accurate estimate, we strongly recommend a private tour so we can customize a package that fits your needs. For your convenience, Crystal Reception Hall provides an interest-free payment plan that includes partial monthly payments. Payments can be made in the form of cash, check, or cashier’s check. To request a private tour or for more information, fill out the form below. Please be as detailed as possible so we can give you accurate information. We appreciate your interest in using our services and look forward to working with you.